Plenty of questions arise as a result of an Alzheimer’s diagnosis. Should you tell your loved one about his/her diagnosis?…When is the right time to put your loved one in a nursing home?…even Can a care-giving spouse date? Paula Spencer Scott, author and expert on dementia and family care, answers all those questions and many more in this edition of The Bottom Line Advocator. In this edition of Conversations with the Experts, Paula Spencer Scott, expert on Alzheimer’s and caregiving, explains how to identify and cope with these four personality types. Becoming a caregiver to an ailing loved one is a life-changing task to take on, and understanding the emotions that come with it are crucial to maintaining a healthy and sustainable lifestyle. 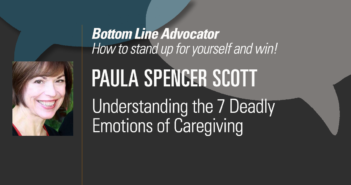 In this edition of The Bottom Line Advocator, Paula Spencer Scott discusses these emotions and, more importantly, addresses how to effectively deal with them.